A many-rayed star is pressed into the underside of the base, number of rays positively correlated with base diameter, though that relationship is imperfect. Dugan vases, for the most part, have larger bases and more rays than the Diamond. Dugan and Diamond vases are, in most instances, also distinguishable in another significant respect: The star inside the rim on Dugan vases is flat; on the Diamond, conical. 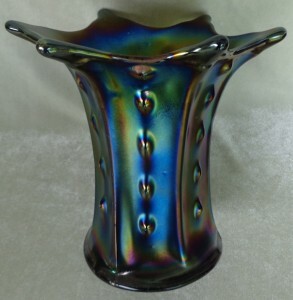 Dugan introduced non-iridescent Target vases no later than 1907. Carnival vases were initially offered in 1909, the year the firm first produced the line. Dugan and Diamond marketed the pattern in carnival for many years, until the late twenties. Vases made by Dugan are available in its staple colors—peach opal, non-black amethyst deep purple, oxblood, and white—and in green, a seldom seen Dugan-Diamond color. They are also known in marigold and the more exotic colors thought to be Diamond. Some colors—the staples and green—bridge the Dugan and Diamond eras. Target vases are seen in two styles: “chunky” and “slender.” Most of the chunky are Dugan, the slender Diamond. Style is determined, as Joan Doty pointed out to me, by the number of rays on the marie in relation to base diameter and by the sheer weight of the product as well as by physical appearance. The chunky are seen in both squatty and swung versions. Nearly all the slender are swung. Dugan’s Target vases are dimensionally substantial. Dugan Targets—with base diameters of three and five-eighth, three and three-fourth, three and seven-eighth, and three and fifteen-sixteenth inches—come in squatty and swung versions. Distinguishing between the two is no problem, even as the squatty varies in height from less than four inches to as much as seven. The easiest way to tell the difference is by the virtually infallible eye test: the squatty look chunky; the swung appear trimmer, yet “muscular.” The squatty have “big mouths,” the swung smaller apertures. Squatty. Peach opal squatty can be found as short as three and one-half inches, although most measure about six inches tall. On the shortest squatty, the uppermost hobs rest on the top edge of the vase. Marigold squatty are also available in the diminutive size. However, they are probably Diamond, as the base diameter is three and three-eighth inches in contrast to the three and three-fourth inches of the peach opal Dugan. Peach opal and white are the most often seen of the six- to seven-inch squatty. Deep purple and oxblood are a good deal tougher to track down. The squatty marigold, surprisingly, are almost impossible to find, probably because this color was made in vastly greater quantities by Diamond than by Dugan. I know of no cobalt blue or other colors in the squatty. The squatty illustrated is a handsome oxblood. It displays fiery amethyst when held toward the sun. It is owned by Kate and Bill Lavelle from Wisconsin. Earlier this year, Samantha Prince, from Pennsylvania, sold an appealing non-oxblood deep purple by way of eBay. Its exterior iridescence is predominantly green, its interior electric blue. The base color of Dugan’s generic amethyst is dark, ranging from virtually opaque, like Kate and Bill’s vase, to the more translucent purple Samantha sold. What contemporary collectors call amethyst is associated with glass made after Diamond assumed ownership of the factory in 1913. Swung Chunky. 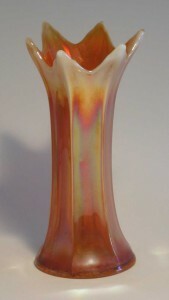 Swung vases produced by Dugan normally range in height from nine to twelve inches. They come in all the staples and in green and “ice lavender.” Peach opal and white are the most available, purple and oxblood harder to find. The Dugan swung look more robust than the Diamond, likely because of their broader bases and greater girth. Green Target vases hardly ever surface. The base diameter of the one pictured is three and three-fourth inches. A 36-point star is pressed into the underside of the base. It is nine and three-fourth inches tall. Don and Kris Dorais, from Rhode Island, found it in a dimly-lit barn near Bainbridge, New York, in 2005, while they were en route to a Burns auction. They bought it for $20. I hope they don’t feel like they got taken on the price. Kevin and April Clark, from Iowa, own two green Target vases. Their Dugan green, a ten-incher with a three and three-fourth inch base and 36-point star, is a non-fluorescent lime. They bought it via eBay, where it elicited little interest and sold for a pittance. April recalls that it was filthy when it arrived and that Kevin spent a good deal of time with Dawn, Soft Scrub, a rag, and a bottle brush bringing its color to life. The Clarks don’t miss much when it comes to online auctions. Their dark green is eleven inches tall. Its relatively small, three and three-eighth inch base diameter and 30-point star suggest it was made by Diamond. Dugan and Diamond must have had trouble stabilizing the chemical cocktail for green carnival as it has been reported in standard, lime, and, in other vases, olive. These firms surely did not set out to make three shades of green. The Clarks most recent find, acquired this summer at the ICGA convention, is an eleven-inch ice lavender. Because it has a three and three-fourth inch base and a 36-point star, it is likely Dugan rather than Diamond. How the color came into being is a mystery. Its lavender base is very light, the iridescence predominantly pastel pinks and blues and evenly dispersed. 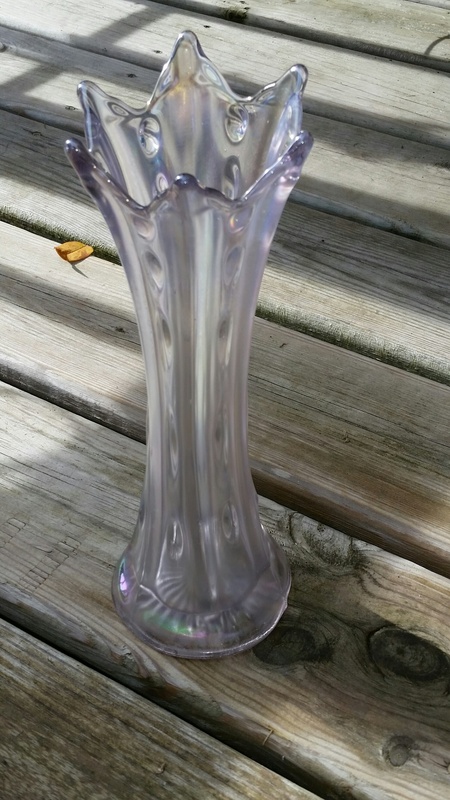 The color reminds me of pastel lavender Constellation compotes, though the vase is lighter yet—see Carnival Glass 101. Compared to the well-built Dugan, Diamond Target vases look scrawny. Their bases are small, their bodies slim. Their bases ordinarily measure three and one-eighth, three and one-fourth, three and three-eighth, or three and one-half inches in diameter. Almost all are swung, the majority ten to eleven inches tall, though some are an inch or two taller. The shorter they stand, the more highly raised and prominent the hobs. On the tallest, the hobs look like teardrops rather than hobs and the ribs are flatter. They have varying numbers of rays on the underside of the base, and the star itself is in the shape of a cone. Made over a span of 15-plus years, the Diamond marigold are plentiful. While they can be nicely colored, many are dull or washed out in appearance. Though phased out of production by the mid to late teens, the peach opal are also available in large numbers. The most desirable of these have abundant opalescence on hobs, ribs, and tops. The slender Diamond white are seen less often than the chunky Dugan. Diamond’s amethyst, with a base color that is lighter than Dugan’s, are not hard to come by, but finding them with great color can be challenging. Horehound and cobalt blue are seen less often. In the late teens and early twenties, Diamond produced a wave of uncommon carnival colors, three of which have been confirmed in Target. These colors may have been experimental, as examples are few and far between. A vaseline opal, with marigold overlay, sold on the McKenna auction, conducted by Tom Burns in 1996, for $400. With opalescence confined to the top edge, not on hobs or ribs, it stands eleven and one-fourth inches tall. The base diameter is three and three-eighth inches. The star on the underside of the base has 30 points. 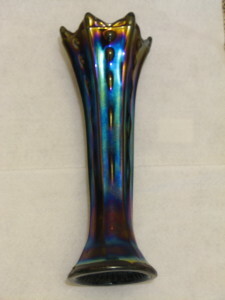 The vaseline opal in the Fry collection, as Diane noted, glows under a black light which distinguishes it from the non-fluorescing lime green. 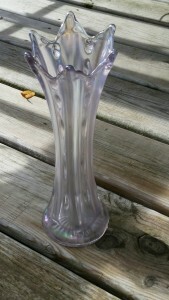 It is pictured in Carl O. Burns’ Dugan & Diamond Carnival Glass, where it is identified as vaseline rather than vaseline opal, and at the Carnival Glass 101 website. The illustrated amber Target, owned by Kevin and April Clark, is the first reported in this scarce Diamond color. It is 12 inches tall. The base, with a 24-point star pressed into its underside, is three and one-half inches in diameter. According to Carl Burns, Diamond produced its amber during a narrow span of years, probably from 1922 to 1925. In shade, it closely resembles the amber made by Imperial in much greater quantities and in far more patterns. 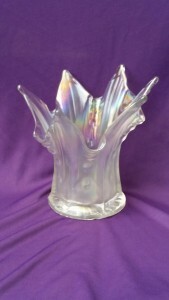 Kevin and April have indicated that an amethyst opalescent, with opal on the tips of flames, was sold by Seeck Auctions a few years back. I have not been able to locate it but would like to know its whereabouts. Dugan or, more likely, Diamond produced little amethyst opal in any pattern. Sadly, no Target vases have been reported in celeste, sapphire, or ice blue. Not all Dugan and Diamond Target vases “fit the mold.” Here are two of them. The illustrated eleven and one-half inch amethyst has the largest reported Target base diameter: three and fifteen-sixteenth inches. It has a 36-point star embedded in the underside of the base. A vase that otherwise would be thought of as Dugan, it has the Diamond coned star rather than the Dugan flat. As Neal Becker, the owner, has observed: “The domed area starts where the star shape begins. It indents a full three-fourth of an inch.” Thus, Diamond in all likelihood produced limited numbers of chunky vases as well as its trademark slender. My guess is that other out-of-the-ordinary Targets exist. 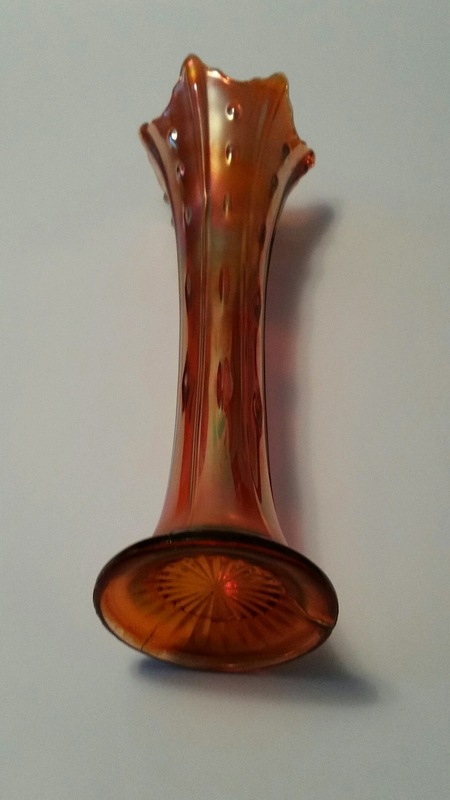 Vase collectors would be interested in learning what else may be out there. The hobs found on the Dugan swung Target vase differentiate it from the hob-absent 1013-R. Confirmed 1013-R vases have three and three-fourth inch bases and 36-point stars pressed into their bases. Reported examples range in height from just under nine to thirteen inches. All known 1013-R are peach opal. They hardly ever change hands. The impressive 1013-R illustrated is Joan Doty’s. It stands eight and three-fourth inches tall. 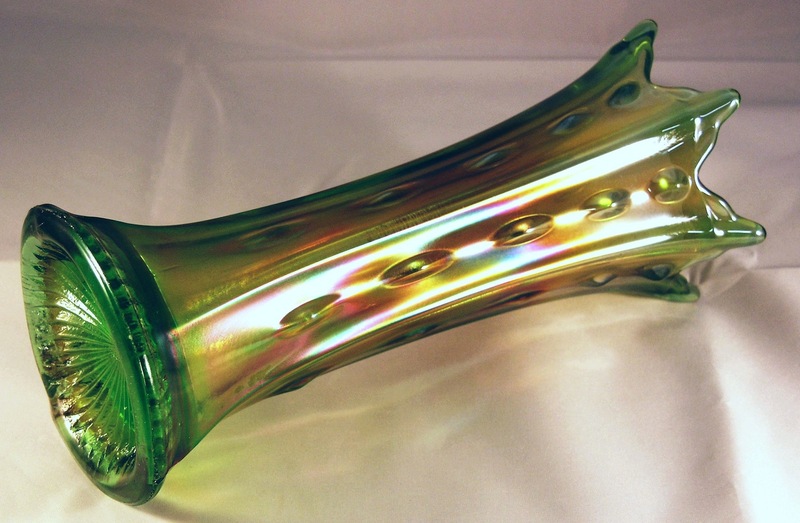 Dugan introduced this vase in non-iridescent opalescent glass. The early vase was called 1013, without the “R” that was attached to the carnival. There is no indication the pattern was produced beyond 1913, the year the firm was restructured as the Diamond Glass Company. 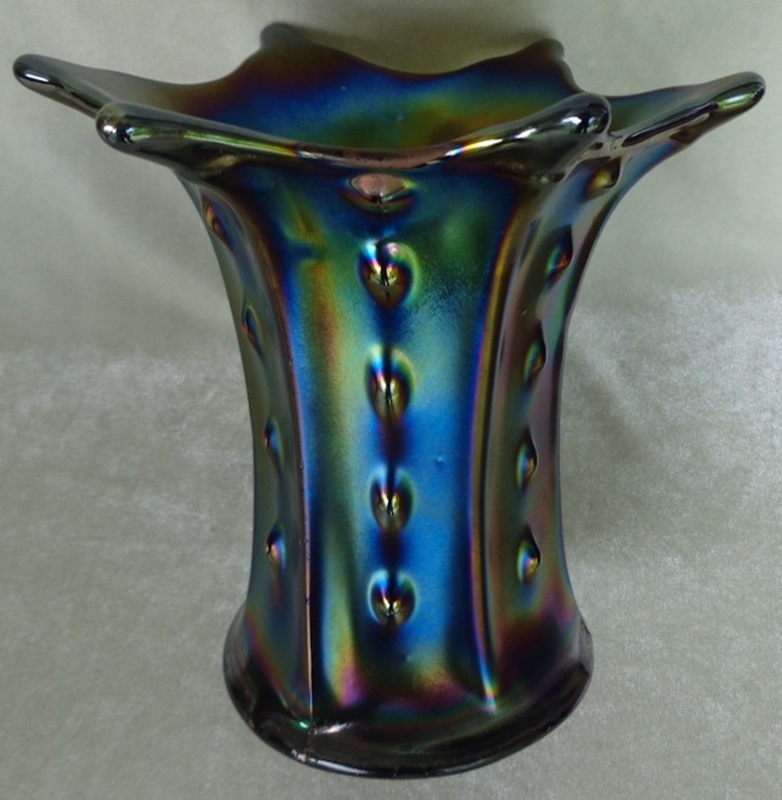 I am grateful to Neal Becker, Kevin and April Clark, Don and Kris Dorais, Joan Doty, Diane Fry, and Kate and Bill Lavelle for offering me the opportunity to showcase vases from their collections and for graciously responding to repeated requests for detail and clarification. The Clarks and Joan, especially, must be relieved the article is finally in print so I will no longer pepper them with questions. I got a kick out of discussing “deep purple” with Kate Lavelle, who in turn debated the matter with her family. Their deliberations forced me think anew about Dugan’s staple colors. 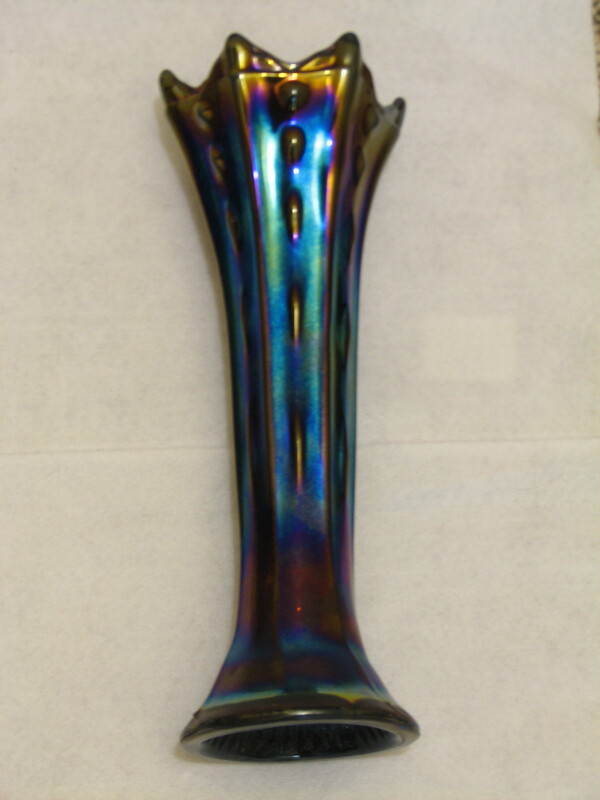 Joan Doty’s article, A Tale of Three Vases, from Carnival Glass Society UK, is indispensable reading for vase collectors. The patterns covered are Target, Pulled Loop, and Wide Panel/Spiralex.